Mahatma Gandhi once proclaimed, “Be the change you want to see in the world,” subsequently steering the Indian people to independence. Inspiring another rally for freedom, Martin Luther King Jr. delivered his ‘I Have a Dream’ speech in the United States of America. Likewise, in South Africa, Nelson Mandela pioneered the war against apartheid. Change has been a fundamental aspect of our society, from Darwin’s Theory of Evolution to leaders such as Alexander the Great, Julius Caesar, Abraham Lincoln – all contributing to this norm that is change. Indeed, such transformations in society have been prolonged, carried from one generation to the next, yet the inherent quality that is change, has sustained since the conception of the universe. And this foundational element that seems to recur in our lives must be inculcated at the bedrock of our growth as learners and future instigators of change. Thus, I am proud to announce, that the Student Council for the academic year 2018/19 has been successfully selected. The Student Council develops the underlying prowess of stimulating change in the school community. Through this institution, students are able to influence meaningful change, despite them being recognized simply as what they are – students. To impact effective change is an indispensable quality, as stipulated by the International Baccalaureate program, and a standard we at MBIS strive to instil in all our students. The formation of the Council commenced with elections – a property deeply rooted in the traditions of democracy. These elections allowed every individual within the school community. Students, teachers and administrative staff alike were given the privilege to vote for a candidate they felt best served the school, and its desire for meaningful change. Returning from last year’s fierce debate, Sneh Deshpande (MYP5B) and Mehek Mehra (DP1A), engaged in another passionate battle, this time for President. Each candidate submitted a video, designed to inform the school community on their policies and vision for Student Council, and subsequent to various electronic ballots one candidate was elected President. Yet, when the dust parted, both candidates stood, having gained each other’s respect in the process of the elections, ready to serve the Student Council and the Student Body. 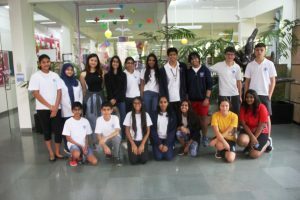 Additionally, JonaMuhammad VanBerkel of MYP 4A has taken up the coveted role of Treasurer, Prisha Kapoor of MYP 4A the responsibility of Secretary, and Anjali Kumaran of MYP 4B will be serving as the official Liaison of Communications. Furthermore, I am honoured to announce that, Mehek Mehra of DP1A will serve and support the Student Council as its Vice President, while I, Sneh Deshpande of MYP5B, as last year’s Liaison of Communications, will assume the responsibilities of President this year. If anything, democracy has shown us that the power of change is limitless. And in its infinite capacity, meaningful change can ensure a successful future. The Student Council has finally commenced, and we’re here to change, and change, we shall. Student Support Services - nurturing the academic, personal and social growth of your child. ‘Who We Are’, PYP 3 chose to inquire into the school’s and IB’s mission.